The first time I made challah I nearly cried. Ok, not nearly. I full-fledged cried. I was expecting instant success because I did everything right. However, I was left with dense (in a bad way), crumbly (in a bad way), tasteless (is there a good way?!) 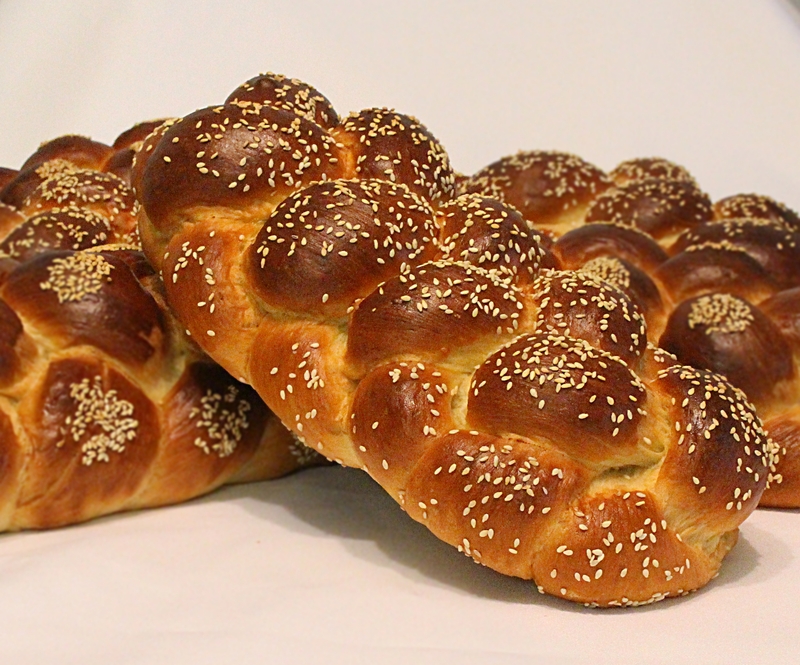 poor excuses for braided bread undeserving of being called "challah". I was traumatized for a bit and swore off the whole thing because, frankly, I don't handle failure all that well. My sister, Goldie, makes the most amazing challah known to man and eventually after watching her make it a few times, I decided to take another stab at it. Success!! They weren't gorgeous and I needed some practice but they earned their way into my heart and I felt like I could finally do this. Finally! Fluffy, sweet goodness! This is her killer recipe. Thanks Goldie!! Few things in the kitchen are more intimidating than working with yeast. It kinda smells weird and if you haven't worked with it, it can be hard to tell what's right and what's not. There's fresh and there's dried and there are those packet thingies. Rapid rising, active dry, instant. Ahhh!! Take a deep breath, I got your back. Let's walk through this. Active dry yeast is what's used in this recipe. It's granular and is alive but not actively growing until it's proofed in warm water. Instant or rapid rising dry yeast is more finely granulated and is therefore more easily proofed. 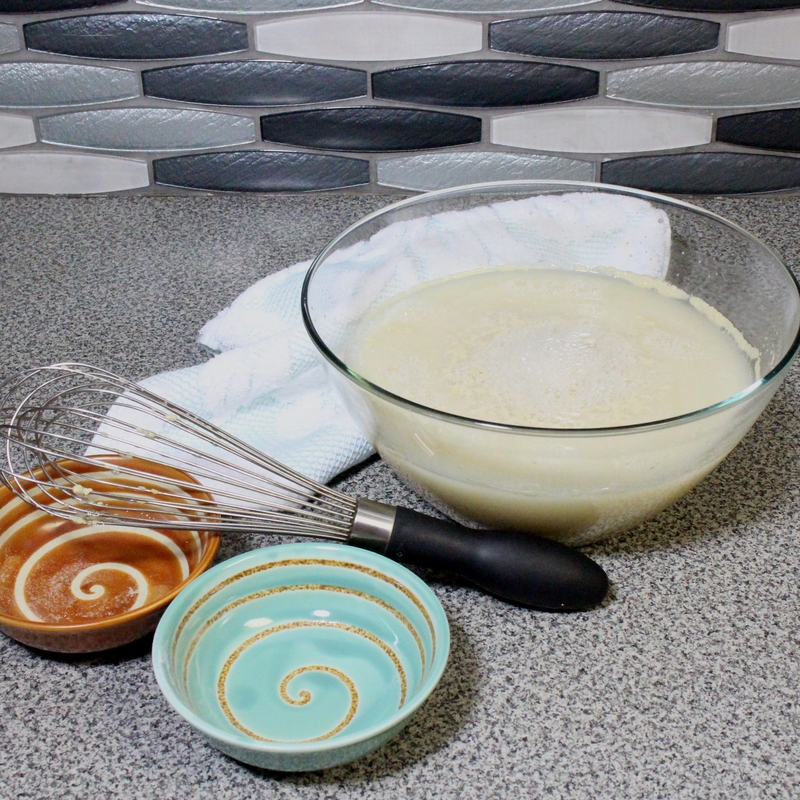 Some recipes call for mixing yeast right in with the dry ingredients. That's when you'd use instant or rapid rising dry yeast. Technically, they can be subbed for one another but since the instant yeast is more finely granulated, there is more yeast per tablespoon, so decrease the amount by 20%. Dry yeast lasts a very long time. I buy a large package from my supermarket and store in a zip top bag in my freezer. Fresh yeast needs to be proofed as well, but since it is highly perishable, I stick with the active dry. Now let's talk about flours. Is there really a difference between high gluten and all purpose flour? Yes. Gluten is what gives baked goods their structure. All purpose flour contains about 8-11% gluten whereas high gluten flour contains 12-15%. Here's the good news, you can use either flour for this recipe and it will still come out great! How? I don't know. Magic or something like that. I prefer not to question it. Another magical tidbit. My sister (same one as before.. the one who developed this recipe) uses 6 lbs high gluten flour, buuuuuut it works great for me when i use just 5 lbs. Contrary to the name of this blog, this is NOT a time to cook with tantrums. Unless you're one of those patient creatures I've heard about. If you're human, wait until the kids are in bed, pour yourself a glass of wine and focus. Pre-measure all of your ingredients so you don't have to fumble around measuring things while your hands are covered in flour or sticky dough. Rubber gloves are a Godsend. Dough doesn't stick as much to them and you won't be cleaning out dough from under your fingernails for a week. You can thank me later for that tip. The first step is proofing the yeast in warm water with a bit of sugar. Why do we do this? Because as mentioned previously, yeast is living and we want to make sure it is still active and living. One might say.. we want.. proof. Yeah, sorry, moving on. We are looking for the yeast to foam up. If the yeast does not foam up, it is no longer living or active and the only waste is warm water and a bit of sugar. Time to start over with new yeast. How warm should the water be? About 100°F, or in mom-speak, the temperature of a baby's bath. Not too hot, not too cool, Goldilox approved. Why sugar? Because sugar feeds the yeast and helps it grow. Combine the yeast, warm water and sugar in a glass bowl, give it a stir and set a timer for 10 minutes to allow it to proof. You know what they say.. a watched yeast bowl never proofs. 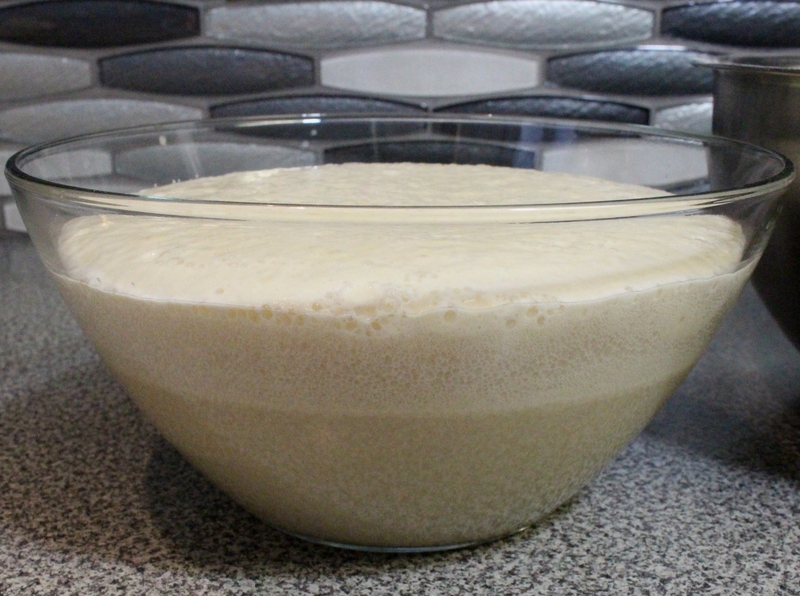 While the yeast is proofing, mix the dry ingredients in a large gigantic bowl. Although the recipe calls for a specific amount of flour, don't use it all right away. Save some on the side to add into the dough later, if it's too sticky to work with as you knead. Better to add flour later than to start off with too much flour. Incorporate the wet ingredients, aside from the yeast mixture. When it gets too difficult to mix with a utensil, get in there with your hands and mix some more. 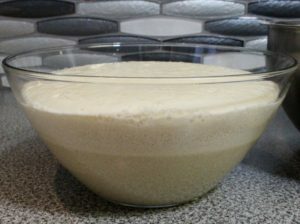 After 10 proofing minutes are up, your yeast will look like this. 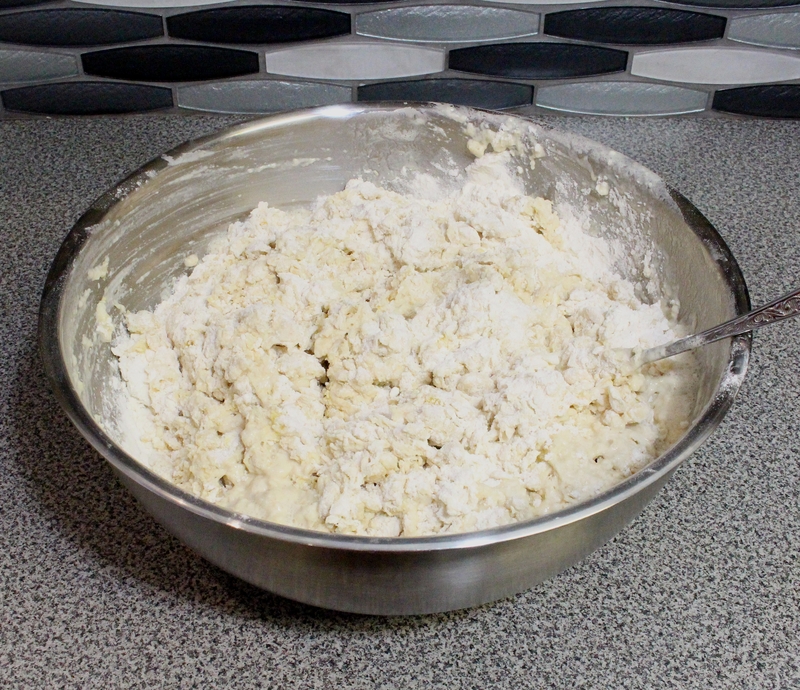 Add the yeast mixture and continue mixing by hand until the ingredients are all well incorporated. Now it's time to knead. 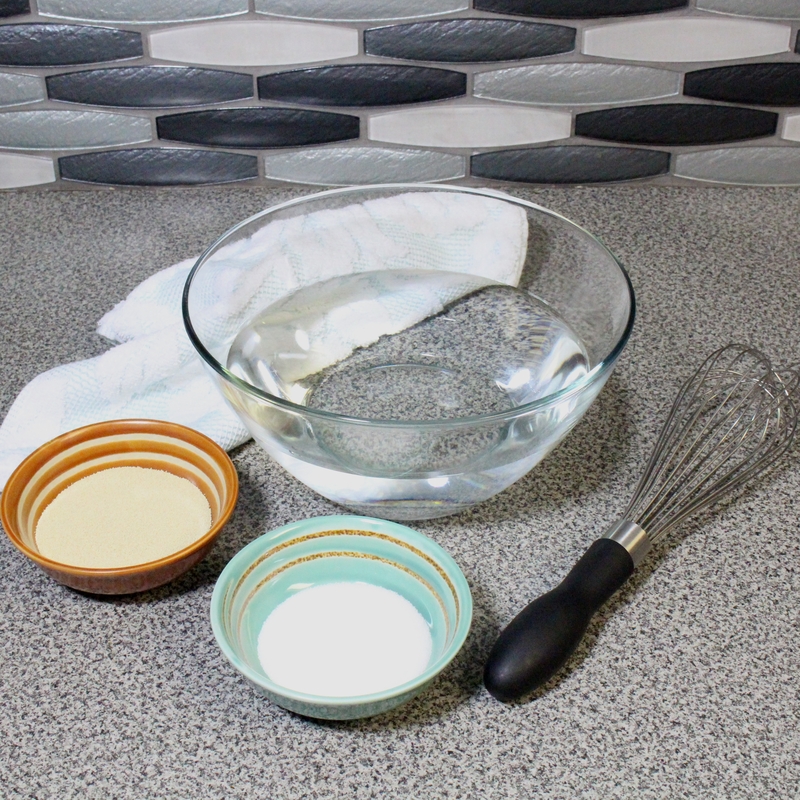 Pour the contents of your bowl onto a lightly floured surface. Press the heel of your hand into the dough, pushing down and forward slightly. Fold the dough over and onto itself and repeat the pushing down and forward movement. Rotate the dough slightly and repeat. And repeat. And repeat. And a few more times as kneaded (Ha!) until the dough is smooth and elastic. 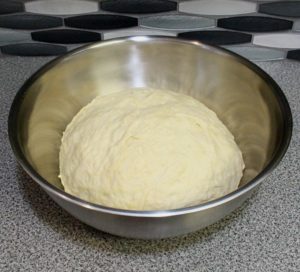 Return the kneaded ball of dough to your gigantic mixing bowl and cover with plastic wrap and a towel. 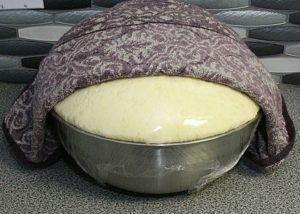 Sing it a lullaby and place it in a warm, draft-free spot to allow the dough to rise for an hour and a half. About as long as it takes to calm a toddler whose toast was cut the wrong way. Remove the bowl from hibernation. This is when we "take challah" or do Hafrasha. 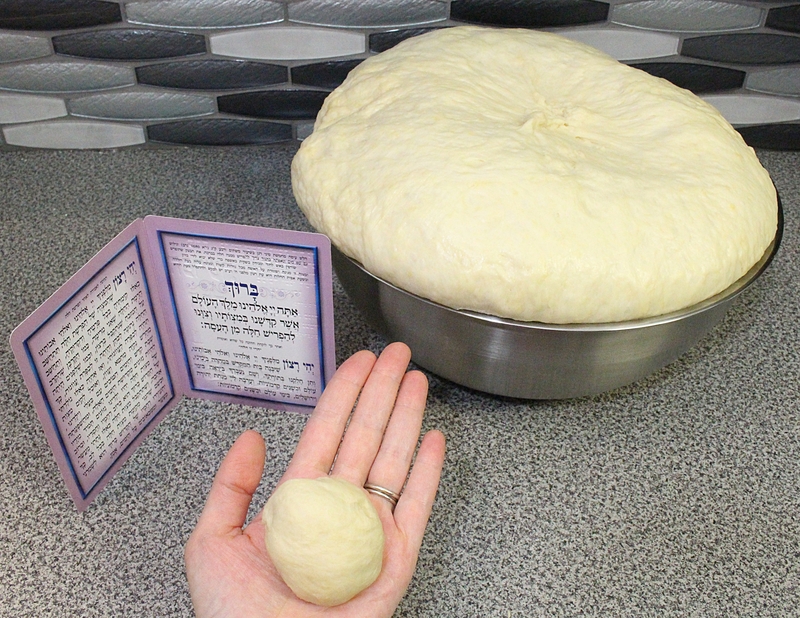 We recite the following Bracha and then pinch off a portion of dough, about the size of an egg. This is a very spiritual moment in which many pray for the health and prosperity of others and for their own families. The portion of dough, which represents the portion of dough that was given to the Kohanim in the time of the Bais Hamikdash, is wrapped in foil and burnt or disposed of respectfully. There are different customs as to how it should be done. Please adhere to your own. Now we portion and braid. (Scroll to the bottom of this post for a video.) I get 6 medium sized challahs from one batch. 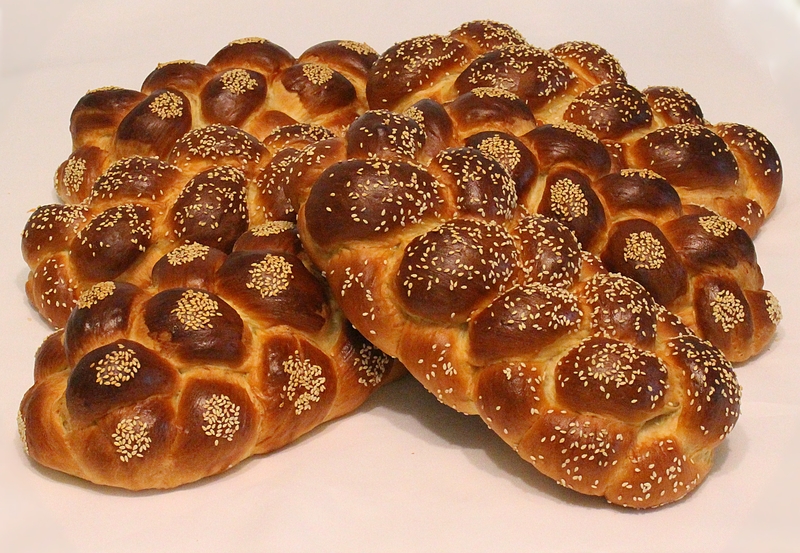 You can make 4 or 5 larger sized challahs or 7-8 smaller sized challahs or make some challahs and some rolls. 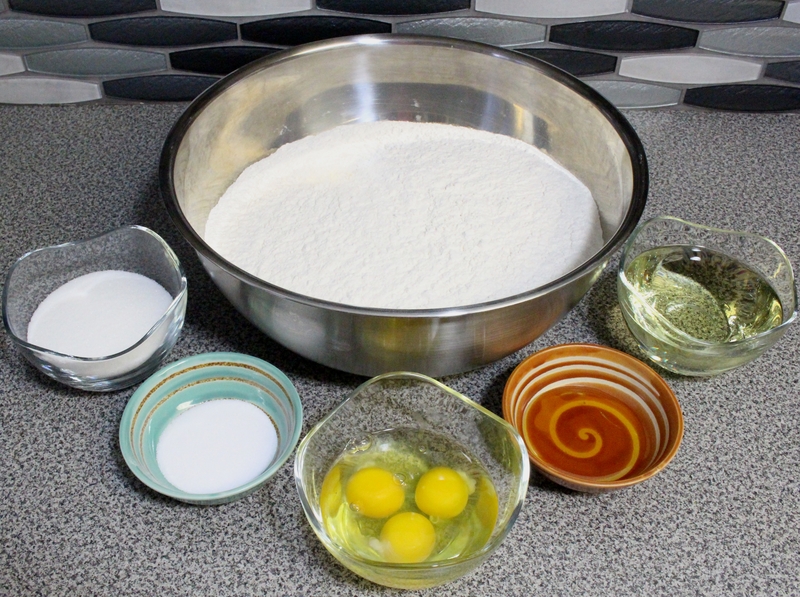 Divide your dough as you wish and then divide each ball of dough into as many strands as you wish to braid, you guessed it, as you wish 🙂 Lightly coat the strands in flour and then braid. Allow to rise about 10 minutes and then egg wash and top with sesame seeds. Bake at 350°F for about 45 minutes. Time varies depending upon the size of your challahs. Rolls will bake considerably quicker than a full-sized challah. These freeze beautifully. Just cool completely after baking and seal very well in large zip top bags and freeze. Defrost as needed. Combine dry yeast, warm water and 2 Tbsp sugar in a glass bowl and set aside to proof 10 minutes. In a very large bowl, combine almost all of the flour with 1 cup sugar and 2 tbsp salt. Add the eggs, honey and oil. Mix well. Return the dough to the large bowl, cover with plastic wrap and a towel. Set aside to rise for 1 hour and 30 minutes in a warm, draft-free spot. Uncover the dough and "take challah" then portion and braid your challahs. Allow to rise 10 minutes then egg wash, sprinkle toppings and bake about 45 minutes. Hi Lynn, each packet contains 2 1/4 tsp of yeast. There are 3 teaspoons in each tablespoon. According to these calculations, you will need 5 full packets to get 4 tbsp. 5 full packets of 3? Or 5 packets meaning 2 strips minus 1? 🙈 Thanks! Hi which brand of yeast do you use ? The Sephardic ("Eidot HaMizrach") version goes: "lehafrish challah terumah"
do serdarim still consider this hamotzi bec of honey and sugar? Hi Cheryl, I'm so glad! This comment made my day! Hi Esta, I just posted a video on this page showing my braiding technique. Hi, you can substitute to fully white whole wheat. The texture will be a bit different but still fluffy and delicious. If I want to substitute honey for sugar, what amount should I use? Hi Adelle. I've never done it but I'm pretty sure you can substitute equal amounts up to 1 cup. I use measuring cups. Dry measuring cups for dry ingredients and wet measuring cups for wet ingredients. Can I halve the recipe? If so- 1 or 2 eggs? Thanks! Hi Samantha. I've never halved the recipe but I'd use 1 full egg and 1 yolk. Hope it works out. Let me know! Hi Minna. I'm sorry you had a hard time with this recipe. There are many factors that determine how much or how little flour must be used to make a manageable dough, like weather, humidity etc. I use the same recipe each time and sometimes need to add a cup or two of flour and sometimes don't need to add any at all. Your best bet is to go by the look and feel of the dough and only add as much flour as you absolutely must to make a nice, cohesive, elastic dough. Better luck next time! Can I use bread flour for this or is high gluten neccessary for the consistency? Hi Judith. You can use bread flour. Even all purpose flour works well. Is there a limit on how long I can leave the dough to rise before plaiting it ?? Obviously won't leave it over night but will it still be ok if I leave it for say 2/2.5 hours or is that too long ? Hi Gaia. I would say up to 2 hours is okay, anything beyond that should be refrigerated until you can come back to it. Is there any way that this best challah recipe can be converted in terms of a bread machine for all us lazy people? Hi Yeva. Yes, you can place ingredients into the machine in the order listed for hand mixing and let the machine do the work for you. 5 lbs of flour is about 18-20 cups. You have to quarter the recipe. I quartered everything, but used one egg. Hi Libby. I never use fresh yeast but if you're more comfortable with it, I don't see why not. You can use a bosch to mix. HI Esty! Would I be able to substitute whole-wheat flour instead of using regular white flour? Hi Avital! You can use whole wheat flour. Comes out great! Perfect! Thanks for your quick response 🙂 I will let you know how it comes out!! I've heard wonders about your challah recipe! Good Shabbas! Hi, is this a sweet challah? We kind of like the not so sweet challah. How much do you think I can reduce the amount of sugar by without adjusting anything else? I live in Israel. Can you translate. How many kilos of flour? Or how many cups? Thanks so much for all your great recipes! Do you sift the flour first or just use straight from the bag? Sifting is probably ideal but I use it straight from the bag. Do you punch down the dough before you portion and braid? Also, have you ever tried using this dough for cinnamon/sugar or chocolate chip challah? No, I do exactly what's written. Yes, it's amazing! Hi, any specific about of time the dough is supposed to be kneaded for?...thanks! I aim for around 10 minutes. I can't wait to try this! I've heard great things about the recipe. About how long would you bake rolls for? I'm never sure how to tell when smaller challahs are done. Thanks! Hi Esty. How did you place the seeds so neatly in the pictur of your challot? Dip a finger in egg wash, then in seeds and press onto wherever you'd like to stamp the seeds. Repeat as needed. I usually do not but there are many factors and it's totally fine to add more beyond the 5 lbs if your dough is sticky. Really wanna try making this in fully whole wheat, but all my previous challah experiences with fully whole wheat have ended up dense and just eh, no matter how fluffy the white version. Do you have first hand experience with making it whole wheat? Does the sugar or honey need to be increased to accommodate the strong flavor of the whole grain? Thanks!! I do not have firsthand experience but i k now many who have made it using whole wheat flour and they said it comes out perfect as written. No substitutions other than flour. Good luck! Can the dough be put in the fridge overnight once it has risen? Yes. Bring to room temperature before proceeding. so i made the Challah for Yom Tov and while it tasted very good it had a crumbly consistency..like it would fall apart when dipping etc. Do you have any idea why this would have happened? I used all purpose flour...than u! It sounds like you didn't knead long enough to activate the gluten. 10 minutes of kneading is perfect. I'm sorry, I do not know firsthand. How much would 5 lbs flour be in cups? Hi Sarah! 5 lbs is approximately 18-20 cups. Love this recipe! It really is the best. Which knife do you use to cut the dough in your video? Hi Rachel! It's called a lettuce knife. It's a plastic knife I like to use because it cuts through the dough just fine but doesn't do any damage to my work surface. Dear ladies! Please pay attention, if you are married to a Sephardic Jew, that makes you Sephardic! and the bracha changes. "ברוך אתה השם אלקינו מלך העולם אשר קידשנו במיצוותיו וציוונו להפריש חלה תרומה"
Baruch ata Adonoy, Eloheinu melech ha-olam, asher kidishanu bimitzvo'sav, vitzivanu lihafrish challah teruma. Other than that this is a great recipe and a great tutorial for braiding challah! What brand of high gluten flour is the best to use in your opinion? Hi. What is the egg wash that you use? The color is beautiful! How many grams of yeast is 4Tbs active dry yeast? How much fresh yeast would i use? I have never worked with fresh yeast,I do not know. dont you have to punch it down after it rises? I want to make your recipe in a small bread machine. Any recommendations for halving the recipe? What should I do about the 3 eggs? What kind of baking sheets do you use? Do you find it makes a difference if they are disposable or not? Can I reduce the sugar and/or leave out the honey?